This article is about the 1959 film. For the video game of the same name, see Plan 9 from Outer Space (video game). Plan 9 from Outer Space is a 1959 American independent black-and-white science fiction horror film written, produced, directed and edited by Ed Wood, starring Gregory Walcott, Mona McKinnon, Tor Johnson, and "Vampira" (Maila Nurmi), and is narrated by Criswell. The film also posthumously bills Bela Lugosi as a guest star (silent footage of the actor had actually been shot by Wood for another, unfinished film just prior to Lugosi's death in August 1956). Other guest stars are Hollywood veterans Lyle Talbot (who claimed that he never refused any acting job) and former cowboy star Tom Keene. Plan 9 from Outer Space was released theatrically in 1959 by Distributors Corporation of America (then credited as Valiant Pictures). The storyline concerns extraterrestrials who are seeking to stop humanity from creating a doomsday weapon that could destroy the universe. The aliens implement "Plan 9", a scheme to resurrect the Earth's dead, referred to as "ghouls". By causing chaos, the aliens hope the crisis will force humanity to listen to them. If not, the aliens will then destroy mankind with armies of the undead. 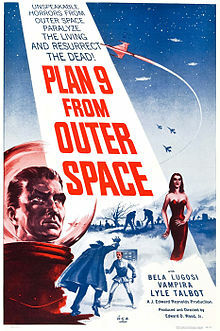 The film was originally developed under the title Grave Robbers from Outer Space, but its financial backers objected to this title, which they saw as being sacrilegious, and it was retitled Plan 9 from Outer Space prior to production. Plan 9 from Outer Space played on television in relative obscurity until 1980, when authors Harry Medved and Michael Medved dubbed it the "worst film ever made" in their book The Golden Turkey Awards. Wood and his film were posthumously given two Golden Turkey Awards for Worst Director Ever and Worst Film. It has since been retroactively described as "The epitome of so-bad-it's-good cinema" and has gained a cult following. At the funeral of an old man's wife, mourners are gathered by an open grave, among them her husband. Overhead, an airliner is heading toward Burbank, California. The pilot, Jeff Trent, and his co-pilot Danny are blinded by a bright light and loud sound. They look outside and see a flying saucer. 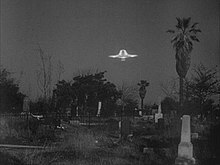 The pilots follow the saucer's flight until it lands at the graveyard, where the funeral's gravediggers are killed by a female zombie. At his home, lost in his thoughts of grief, the old man goes outside and (offscreen) steps in front of an oncoming car and is killed. Mourners at the old man's funeral later discover the dead gravediggers. Inspector Daniel Clay and other police officers arrive, but Clay goes off alone to continue his investigation. Trent and his wife Paula, who live near the graveyard, hear the sirens and Jeff tells Paula about his saucer encounter, stating that the Army has since sworn him to secrecy. A powerful swooshing noise then knocks everyone to the ground at both the Trent residence and the nearby graveyard as a saucer lands. Police Inspector Clay then encounters the female zombie and the reanimated corpse of the old man, and is killed by them. Upon investigating Clay's disappearance, Lt. Harper states, "But one thing's sure. Inspector Clay is dead, murdered, and somebody's responsible." Newspaper headlines continue to report saucer sightings over Hollywood Boulevard, while a trio of saucers flies over Los Angeles. In Washington, D.C., the military fires missiles at more saucers, while the Chief of Saucer Operations, Col. Thomas Edward, reveals that the government has been covering up saucer attacks. He mentions that one small town was annihilated, hinting at a secret history of other encounters. The aliens return to their Space Station 7. Commander Eros informs their ruler that he has been unsuccessful in contacting Earth's governments. To force their acknowledgment, Eros recommends implementing "Plan 9", which will resurrect recently human dead by stimulating their pituitary and pineal glands. Meanwhile Trent, about to leave on another flight, is concerned for his wife's safety. He urges her to stay with her mother, but she insists on staying home. That night the zombie old man rises from his grave and breaks into their house. He pursues Paula outside and is joined by his zombie wife and the zombie Inspector Clay. Paula barely escapes, but then collapses after her ordeal. All three zombies return to Eros' saucer. At the Pentagon, Gen. Roberts informs Edwards that the government has been receiving alien messages. They explain that the aliens are trying to prevent humanity from eventually destroying the universe. The general dispatches Edwards to San Fernando, California, where most of the alien activity has occurred. Though the undead are under alien control, zombie Clay suddenly attacks and nearly strangles Eros. The ruler closely examines zombie Clay and then orders the zombie old man destroyed in order to further frighten humanity. He then approves Eros' Plan 9 to raise undead armies and orders they march on the capitals of Earth. In California the police and Edwards interview the Trents. Unknown to them, the flying saucer has returned to the graveyard. Officer Kelton encounters the zombie old man, who then chases him into the Trents' yard, where the zombie old man is hit with Eros' ray, causing his body to rapidly decompose. Not knowing what to make of this, the Trents, Edwards and the police drive to the cemetery. John Harper insists on leaving Paula in the car, but Paula refuses to stay alone; as a concession, Kelton stays behind. Eros and fellow alien Tanna send zombie Clay to kidnap Paula and lure the other three to their saucer. Seeing the saucer's glow off in the distance, Trent and the police head in that direction. At the car, Kelton is knocked out by zombie Clay. Upon awakening, Kelton calls for help and Patrolman Larry comes to his aid. Eros allows Trent and the police to enter his saucer with their guns drawn. He then tells them human weapons development will inevitably lead to the discovery of "Solaronite", a substance that has the effect of exploding "sunlight molecules". Such an explosion would set off an uncontrollable chain reaction, destroying the entire universe. Eros now believes humans are too immature and stupid ("You see? You see? Your stupid minds. Stupid! Stupid! "), so he intends on destroying mankind. He threatens to kill Paula if Trent and the police try to force him to go with them. Officers Kelton and Larry arrive, spotting zombie Clay holding the unconscious Paula not far from the saucer. Realizing their weapons are useless, they sneak up behind Clay and club him with a length of wood, knocking him out. Eros sees this and says Clay's controlling ray has been shut off, which allows Paula to go free. A fight then breaks out between Eros and Jeff, but the saucer's equipment is damaged during the struggle, starting a fire aboard. The humans quickly escape, and Tanna and the unconscious Eros fly away in their now burning saucer, which finally explodes, killing them both; their zombies quickly decompose to just skeletal remains inside their clothing. Pilot Jeff Trent (Gregory Walcott) confronts the aliens. 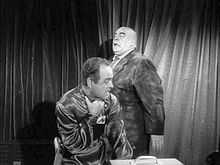 The corpse of Inspector Clay (Tor Johnson) attacks Eros (Dudley Manlove). The film combines elements of science fiction, Atompunk, and gothic horror. Science fiction remained popular throughout the 1950s, though the genre had experienced significant changes in the post-war period. The Atomic Age, heralded by the development of nuclear weapons and the atomic bombings of Hiroshima and Nagasaki, had inspired science fiction films to deal with the dangers of unrestricted science, while spaceflight and the existence of extraterrestrial life and civilizations (more "traditional" elements of the genre), seemed to hold new fascination for audiences at the beginning of the Space Race. On the other hand, Gothic fiction had enjoyed the height of its film popularity during the 1930s and 1940s. It was in decline by the 1950s and was viewed as old-fashioned. By 1950s standards, the combination of dated and modern elements gives the film a rather anachronistic quality. Plan 9's script seems to aim at being an epic film, a genre that typically requires a big budget from a major film studio. That Ed Wood made it with minimal financial resources underscores one of the qualities of his work: His ideas tended to be too expensive to actually put on film, yet the director attempted to do so anyway. As Rob Craig argues, Wood's failed attempts result in the film having a peculiar charm to its audiences. Craig finds that Plan 9 has much in common with both epic theatre ("grand melodrama on a minuscule budget") and the Theatre of the Absurd (characters acting as buffoons, nonsense, and verbosity in dialogue, dream-like and fantasy imagery, hints of allegory, and a narrative structure where continuity is consistently undermined). The film opens with an introduction by Wood's friend, psychic Criswell: "Greetings my friends! We are all interested in the future, For that is where you and I are going to spend the rest of our lives! , , , ". (This line appears in the narration for the General Motors' "Futurama" ride and its accompanying film, To New Horizons, that were part of the 1939 New York World's Fair—years before Criswell's own television program.) At the time of filming, Criswell was the star of the KLAC Channel 13 (now KCOP-13) television series Criswell Predicts. The introduction could be an allusion to the opening lines of his show (a Criswell Predicts title card appears at the start of the scene), but since no episodes of the television show are known to survive, a comparison is impossible. Craig suggests that Criswell's public persona was based on the style of a charismatic preacher, perhaps influenced by early televangelists. 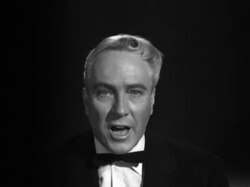 Criswell addresses the viewers repeatedly as "my friends", as if attempting to establish a bond between the speaker and the audience. The line is likely to derive from his show, and would not be out of place in a segment where a televangelist addresses his congregation. Another phrase of the introduction, "Future events such as these will affect you in the future", served as a signature line for Criswell. He used it repeatedly in his newspaper and magazine columns, and probably his show as well. Another line asserts that the audience is interested in "the unknown, the mysterious, the unexplainable", probably assuming that the film's audience will have a fascination with the paranormal. The narrator at some point starts claiming that "we" (the filmmakers) are bringing to light the full story and evidence of fateful events, based on the "secret testimony" of the survivors. The narration seems to emulate the style of sensational headlines in tabloid newspapers, and promises audiences access to "lurid secrets" as if following the example of True Confessions and other similar scandal magazines. The notion that a film or show could be based on true incidents and testimony would be familiar to a 1950s audience, because it was used in contemporary police procedurals such as Dragnet. Changing the tone, Criswell delivers the sermon-like lines: "Let us punish the guilty! Let us reward the innocent! ", which again sounds like a preacher addressing his congregation. The introduction concludes with the dramatic question: "Can your heart stand the shocking facts about graverobbers from outer space"? The latter phrase was simply the original title of the film, but the rest of the line again seems to emulate the sensationalist press. Through Trent's initial conversation with his wife, the film introduces the notion of a government and military conspiracy to cover up information on documented UFO sightings. This notion was clearly influenced by the emergence and increased popularity of a UFO conspiracy theory. The implications concerning the public's distrust of the government were atypical for a 1950s American film. Anti-statist ideas were to become more popular in the 1960s, which is when the subject became "safe" for mainstream cinema. The film contains a cautionary message from the aliens. The earliest use of this concept in film was probably in The Day the Earth Stood Still (1951), and it had since seen frequent use in science fiction films. The idea was that the self-destructive behavior of humanity was the real threat, not any external source of danger. The "iconic" flying saucer of the film has been variously identified as a paper plate or a hubcap. According to the documentary Flying Saucers Over Hollywood, The Plan 9 Companion (1991) it was actually a recognizable model kit produced in 1956 by toy manufacturer Paul Lindberg. Lindberg Line model kits had introduced a flying saucer kit, roughly matching the popular image of UFOs of the time: "a silver disc-shaped craft with a clear dome on top." Inside the plastic dome was a little green man. Both a regular version of the assembled model and a modified version appear in the film. Footage of Los Angeles is used to ground the otherworldly events to a realistic setting. As a resident, Wood was probably familiar with the locations. The scene where the military fires at the flying saucers is actual military stock footage. The Rev. Lynn Lemon, who plays an unnamed minister, was one of the Baptists variously involved in the production of the film. J. Edward Reynolds was a leader of the Southern Baptist Convention in Beverly Hills, California, and Hugh Thomas was one of his associates from the church; both play gravediggers, while Reynolds was also the executive producer of the film. At the time of the film's creation, David De Mering was the personal secretary and alleged lover of fellow cast member Bunny Breckinridge; his inclusion in the cast was probably a result of this association. According to Maila Nurmi (Vampira), she was recruited by Paul Marco to act as a vampire in the film. She was offered $200 for her part. She recalled insisting that her part be silent, as she did not like the dialogue that Wood had written for her. This recollection might be inaccurate, since the undead of this film are generally mute. What she contributed to the film was a "regal presence" and theatrical mannerisms. Her performance is reminiscent of a silent film actress; she credited Theda Bara as her main influence for the part. The male alien Eros is apparently named after Eros, Greek god of love. Craig suggests that the name of the female alien, Tanna, might invoke the name of another Greek deity: Thanatos, god of death. The Pentagon office depicted includes a map of the United States with the sign of the Atchison, Topeka & Santa Fe Railroad. The same map appears in Baghdad After Midnight (1954), which was also filmed at Quality Studios; it was probably a standard prop used by the studio. Bela Lugosi, in silent footage for the abandoned The Vampire's Tomb, which was later recycled for Plan 9 from Outer Space. 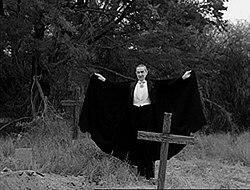 Shortly before Lugosi's death in August 1956, he had been working with Wood on numerous half-realized projects, variously titled The Vampire's Tomb or The Ghoul Goes West. Scenes unconnected to Plan 9, featuring Lugosi weeping at a funeral, walking in front of Tor Johnson's house at daytime, walking in and out of the side door of the Johnson home at nighttime and a daylight scene on a patch of scrub land near a highway showing Lugosi stalking towards the camera and dramatically spreading his Dracula cape before furling it around himself and walking back the way he came, had been shot. Only the first two sequences had reached any level of completion. When Lugosi died, Wood shelved these projects. Shortly after Lugosi's death the story and screenplay for Grave Robbers from Outer Space were written and finalized, with Wood planning to use the unconnected, unrelated footage of Lugosi as a means of putting a credit for him on the picture. Wood used the Lugosi footage as a means of attracting actors to the picture, gaining the interest of Gregory Walcott and Maila Nurmi, among others, by telling them he was making "Bela Lugosi's last movie". Though Wood's actions were driven in part by the desire to give his film a "star name" and attract horror fans, the Lugosi cameo was also meant as a loving tribute and farewell to the actor, who had become fast friends with Wood in the last three years of Lugosi's life. Wood hired his wife's chiropractor, Tom Mason, as a stand-in for Lugosi, even though Mason was taller than Lugosi and bore no resemblance to him, making him one of the earliest "fake Shemps". Narration from Criswell was also employed in an attempt to better link Lugosi's footage with the rest of Plan 9. Every last scrap of material Wood had of Lugosi was utilized in the theatrical cut of the film, including what are minor sprocket discolorations, film trims that would in a normal film be discarded as unusable. Cuts of the film on VHS during the '80s and '90s, the vast majority of which were unauthorized bootleg dupes, varied drastically not only in quality but also in the amount of Lugosi material retained. Coincidentally, further Lugosi footage Wood had shot at an unspecified pre-1956 date was to have been the basis of a second posthumous movie for the horror legend, titled Ghouls of the Moon. The footage had, however, been shot on volatile acetate stock and had dissolved into toxic-smelling sludge by the time Wood's thoughts turned to the new venture in the summer of 1959. Ghouls of the Moon was abandoned entirely as a result. Mystery surrounds the content and nature of the lost material, described only as 'wild' by a friend of Wood's who had seen the raw footage shortly after it was shot. Grave Robbers from Outer Space was shot in November 1956 and had a private preview March 15, 1957 screening at the Carlton Theatre in Los Angeles (the onscreen title at this time was Grave Robbers from Outer Space). Another year elapsed before Distributors Corporation of America (DCA) picked up the film and copyrighted it, intending to distribute it during the spring of 1958. The company folded, however, and it was not released until July 22, 1959, through DCA's receiver, Valiant Pictures. By then it had been re-titled Plan 9 from Outer Space. The film's name had concerned its backers, two local Baptist ministers, who objected to the "Grave Robbers" part of the title. They reportedly considered the direct reference to grave robbing to be sacrilegious, so Wood changed the title to "Plan 9". The original title is mentioned at the end of Criswell's opening narration when he asks the audience, "Can your heart stand the shocking facts about grave robbers from outer space?" It is also possible Wood changed the title because he did not want his backers to know that the film was finally being distributed (by 1959, they may have completely given up all hope of seeing a return on their investment). The new title, however, was less indicative of the film's content and may have contributed to its distribution problems. Like many independent films of the period, Plan 9 was distributed under a states' rights basis. Plan 9 was screened as part of a double feature at various times. In Chicago, it was first seen alongside the British thriller Time Lock (1957), a film which is mostly remembered as an early film credit for Sean Connery. Later that year, it was used as a "co-feature" (B movie) for double-feature screenings of The Trap (1959), a film noir starring Richard Widmark. In Texas, it was seen alongside Devil Girl From Mars (1954), a 5-year-old British science fiction film. Not long after, the picture was sold to television and was shown on Chiller Theatre and similar venues for years. Plan 9 from Outer Space gained notoriety through the Medveds' book because of its multiple continuity problems. Viewers who have seen Plan 9 in theaters or on television have often laughed at the random mistakes viewed in the film, blaming it on Ed Wood's careless staging. These include visible microphones, ordinary chairs doubling for aircraft equipment, and plumbing hardware visible aboard the aliens' flying saucer. Wood, however, framed his shots for theatrical widescreen viewing, expecting that the ephemera at the top and bottom of the frame would be cropped when projected. Only when the film is viewed in its original widescreen aspect ratio does it become apparent that Wood did compose his scenes correctly. The various objects intruding on the picture were never meant to be seen by the audience. Recent Plan 9 DVD releases restore the viewed images to their proper ratios, in a manner consistent with Wood's original intentions. 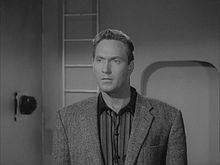 Critics say the absurdity of Plan 9 from Outer Space is found in the dialogue rather than on-screen action. Criswell's opening narration redundantly informs the viewer that "future events such as these will affect you in the future", while referring to viewers as "my friends" four times in the same minute. Criswell also begins the narration by referring to future events, only to later describe them in the past tense ("... the full story of what happened on that fateful day"), and inexplicably calling for "the guilty" to be punished. Several sound stage exterior sets are interspersed with second-unit footage shot outdoors (for example, the old man's reanimated corpse chasing Paula Trent through the cemetery). In a number of these scenes, the outdoor footage was intended to be shot day-for-night, but this is not apparent in the film's video transfers, making these scenes contrast harshly against the on-set footage. Additionally, the military soldiers' hats are slightly lopsided, the "cemetery" and graves are obviously made out of wood, and the alien's leader wears a generic stage play "medieval soldier" costume. A visible shadow of the boom microphone (center of photo's upper edge) in a cockpit scene. 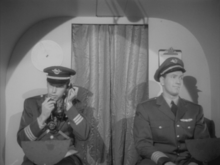 During the first aircraft cockpit scene, the first officer is visibly reading from a script in his lap, and a flash of light from a flying saucer reveals the shadow of the boom microphone. The microphone and flight officer's script are not visible in the original theatrical release, as they do not fit the frame for its original 1.85:1 projected aspect ratio. These mistakes are noticeable only in the film's open matte video transfers. 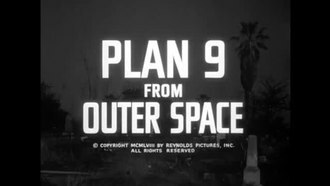 The music for Plan 9 from Outer Space was compiled by Gordon Zahler. Zahler used stock recordings of works by about a dozen composers, which was a fairly common procedure in the 1950s for scoring low-budget films and television programs. However, Zahler apparently never provided a reliable accounting for the score. In 1996, Paul Mandell produced a CD that recreated the film's score by tracking down the stock recordings and the composers; Mandell subsequently wrote an article about the film's music for Film Score Monthly. Some websites give proper credit to these composers. In 2006 Legend Films released a colorized version of Plan 9 from Outer Space on DVD. Though the colorization process was largely done straight, unlike the campy bright colors used in the studio's release of Reefer Madness, there were a few alterations. Legend had auctioned off the opportunity to insert new material into the film through two auctions on eBay. The first allowed the auction winner to provide a photograph that is digitally inserted into part of the scene between the Ghoul Man and Paula Trent. The second allowed the winner to have his or her name placed on a gravestone during a scene with Wood regular Tor Johnson. The third alteration is at a point where Eros gets punched and his skin briefly turns green. The Legend Films colorized release was screened in Atlanta, Georgia at the Plaza Theatre on September 9, 2006, and was hosted live by Elvira impersonator Patterson Lundquist with a live running commentary. As a part of the promotion sets of the autographed Michael J. Nelson DVD were given away as prizes. The event was featured in The Atlanta Journal-Constitution and served as the grand re-opening of the theater, which had fallen on hard times under previous ownership. Autographed pre-release copies of the DVD were made available in 2005, and the colorized version was also given special theatrical screenings at various theaters throughout the United States, including the Castro Theatre. The DVD featured an audio commentary track by comedian Michael J. Nelson of Mystery Science Theater 3000 fame, in which he heckles, or "riffs" the film in a style similar to an episode of the series, a restored black-and-white version of Plan 9, a home video of Wood in drag performing a striptease (Wood, in real life, was a transvestite), a subtitled information track and a comedic feature narrated by Nelson detailing the "lost" Plans 1–8. The autographed edition also came with a limited edition air freshener. Nelson's commentary is also available through his company RiffTrax, where it can be downloaded as either an MP3 audio file or a DivX video file with the commentary embedded into the colorized version of the film. In 2011 PassmoreLab, a San Diego-based 3D production/conversion studio, produced a 3D version of Legend's colorized version, which received limited theatrical release. In 1992 Plan 9 from Outer Space was the subject of a documentary called Flying Saucers Over Hollywood: The Plan 9 Companion, which is included on Image Entertainment's DVD edition of Plan 9. 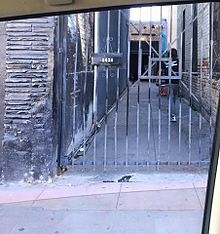 The documentary visits several locations related to the film, including the building with Ed Wood's former office (at 4477 Hollywood Blvd), and what was left of the small sound stage used for the film's interiors, which is down a small alley next to the Harvey Apartments located at 5640 Santa Monica Boulevard. That same year, Rudolph Grey's book, Nightmare of Ecstasy: The Life and Art of Edward D. Wood, Jr., was published and contained anecdotes regarding the making of this film. Grey notes that participants in the original events sometimes contradict one another, but he relates each person's recollections for posterity, regardless. In 2006 another documentary by Kevin Sean Michaels, titled Vampira: The Movie, chronicled Maila Nurmi's work with Wood and her role as television's first horror host. Two adjoining shots, in open matte and 1.85:1. The top image was composed for widescreen, the bottom is military stock footage that was not. To date there have been only a handful of good quality or restored DVDs and Blu-rays. A good quality 35mm print from the Wade Williams Collection was released on DVD in the US (Image Entertainment, 2000), UK (MPIC Video, 2009), Germany (Winkler Film/Alive AG, 2009) and Australia (Force Video, 2001). All feature the Flying Saucers Over Hollywood documentary and the original theatrical trailer. Legend Films' restored colorized and original black-and-white versions have been released on both DVD and Blu-ray in the US, and DVD in various other territories. No home video release has featured the film's original theatrical aspect ratio. Plan 9 was composed and shot for the 1.85:1 aspect ratio theatrical projection, the predominant widescreen format. As unskilled a filmmaker as he was, Ed Wood never intended for his film to be seen in a 1.33:1 open matte aspect ratio. This has led to various boom mics and edges of props, etc., being seen at the top and bottom of the image, which have since come to be intrinsically associated with the viewing of this film. Further complicating the matter, Wood incorporated stock footage framed in 1.33:1 (including his own footage of Bela Lugosi), which becomes overly cropped when shown in widescreen. Filmmaker Ernie Fosselius (of Hardware Wars fame) created the 2009 short film Plan 9.1 from Outer Space, which featured hand-carved wooden puppets of the characters from the film. The puppets acted out the scenes along with the edited soundtrack of the original film. As of September 2009, there was an additional proposed remake: Grave Robbers from Outer Space was written and directed by Christopher Kahler for Drunkenflesh Films. Another remake was released by Darkstone Entertainment, written and directed by John Johnson. The teaser trailer was released on the film's official website on September 9, 2009. Horror host Mr. Lobo, Brian Krause, and Internet celebrities Matt Sloan, Aaron Yonda, James Rolfe, and Monique Dupree performed in the film, which was released through Video On Demand beginning February 16, 2016, and then released on physical media in stores on January 5, 2017. A flying saucer above the graveyard. Plan 9's special effects have been called "hilarious". Plan 9 from Outer Space is considered by some critics, including Michael Medved, to be the worst film in the history of cinema. Other reviews, however, have rated the film more positively. The film review aggregator website Rotten Tomatoes gave the film positive ratings, with a 67% consensus of its critics observing: "The epitome of so-bad-it's-good cinema, Plan 9 from Outer Space is an unintentionally hilarious sci-fi 'thriller' from anti-genius Ed Wood that is justly celebrated for its staggering ineptitude". Many of them stated that the film is simply too amusing to be considered the worst film ever made, claiming that its ineptitude added to its charm. There were also claims that the director even managed to convey some interesting ideas. The Encyclopedia of Science Fiction, for instance, claims that in recent years "the film's reception modulated away from jovial mockery of its wanton indifference to normal professional standards of script, performance, and effects, in favour of a more nuanced appreciation of its dreamlike narrative assemblage of genre tropes, resonantly unspeakable dialogue, and irrepressible budgetary ingenuity." As of 2011, Plan 9 had failed to place in the IMDb Bottom 100, a list compiled using average scores given by Internet Movie Database users, though some of Wood's other movies had. In 1996 the film received a salute by the author of the Cult Flicks and Trash Pics edition of VideoHound, in which it is stated: "The film has become so famous for its own badness that it's now beyond criticism". The film's title was the inspiration for the name of Bell Labs' successor to the Unix operating system. Plan 9 from Bell Labs was developed over several years starting in the mid-1980s and released to the general public in 1995. In 1996 Paul Mandell produced a CD that recreated the film's musical score; the CD was released by the now-defunct Retrosonic Corp. In 1997, David G. Smith wrote and composed the music for Plan 9 from Outer Space: The Musical. In October 2005 a stage adaptation, Plan Nine from Outer Space: The Rip-Off, was staged in Jacksonville, Florida. The play, based on Ed Wood's script, was written by Steven Bailey. In 2006, another stage adaptation, Plan LIVE from Outer Space!, was staged at the Toronto Fringe Festival. The play, based entirely on Wood's script, was written by James Gordon Taylor; it won a Canadian Comedy Award the following year. A stage adaptation was also performed in Glasgow by Off World Productions in 2015, again based on Wood's script.. The Off World production was also performed at the 2017 Edinburgh Fringe Festival. In the Seinfeld episode titled "The Chinese Restaurant", the episode's entire storyline involves trying to get a table at a Chinese restaurant before going to see Plan 9 from Outer Space, which is playing for one night only. Jerry emphasizes the significance of Plan 9, saying, "Just a movie? You don't understand. This isn't plans 1 through 8 from outer space. This is Plan 9! This is the one that worked, the worst movie ever made"! One level from the 2005 video game Destroy All Humans! features the alien protagonist causing mayhem at a drive-in theater that is playing a looped scene from Plan 9: specifically, when the flying saucers are being attacked by the United States military. The scene in question can also be unlocked for viewing by the player. A portion of the film was featured in The X-Files episode "Hollywood A.D.", broadcast in April 2000. The series' protagonist, Fox Mulder, is paid a visit by his partner Dana Scully at his home. The film is playing on the television, and the VHS sleeve is seen as Mulder states that he has seen Plan 9 42 times. In 1991, Eternity Comics released a three-issue miniseries, Plan 9 from Outer Space: Thirty Years Later!, which served as an unofficial sequel to the film. An adventure game of the same name was made, in which the player must recover the film from Lugosi's double, who has stolen it. The film was included in live performances at the SF Sketchfest by The Film Crew, composed of former Mystery Science Theater 3000 cast members Michael J. Nelson, Kevin Murphy, and Bill Corbett. A commentary based on the performances was released by RiffTrax. It was advertised as a "Three Riffer Edition", due to Nelson's solo commentary for the film's colorized DVD release, which had previously been sold as an audio file on the Rifftrax website. On August 20, 2009, the RiffTrax trio performed the commentary at a live event in Nashville, Tennessee, and the performance was broadcast to theaters across the United States. The 1994 film Ed Wood is an Oscar-winning American comedy-drama biopic that was produced and directed by Tim Burton and stars Johnny Depp. It depicts Ed Wood's creation of Plan 9 from Outer Space. The film was released to critical acclaim but was a box office bomb, making only $5.9 million against an $18 million budget. It went on to win two Academy Awards: Best Supporting Actor for Landau and Best Makeup for Rick Baker, who designed Landau's prosthetic makeup) and the makeup for Ve Neill and Yolanda Toussieng. A 2016 remake of Plan 9 from Outer Space premiered at Berkeley, CA's Impact Theatre. Splathouse's production was a stage-and-film hybrid that featured newly-shot footage for the production shot and directed by Edwin Fernando Gonzalez and Mike Delaney. In connection with the Planet Nine hypothesis, the movie title recently found its way into academic discourse. In 2016, an article titled Planet Nine from Outer Space about the hypothesized planet in the outer region of the Solar System was published in Scientific American. Several conference talks since then have used the same word play, as did a lecture by Mike Brown given in 2019. ^ "Plan 9 from Outer Space (X)". British Board of Film Classification. January 29, 1960. Retrieved November 10, 2014. ^ a b "Plan 9 From Outer Space quotes". Rotten Tomatoes. Fandango. Retrieved December 31, 2018. ^ Palopoli, Steve (May 31, 2006). "Cult Leader: "Plan 9 from Outer Space"". Metro Silicon Valley. Retrieved May 3, 2013. ^ "Plan 9 From Outer Space". Quotes.net. Stands4 LLC. Retrieved December 31, 2018. ^ Craig 2009, p. 286. ^ a b c d e f g h i j k l m n Craig 2009, pp. 138–177. ^ "Criswell quotes". Movie Quotes Database. Movie Quotes Database. Retrieved January 2, 2019. ^ a b c Peary 1981, pp. 266–270. ^ "Week's Attractions at the Neighborhood Movie Theaters." The Washington Post and Times Herald (1954-1959) [Washington, D.C], June 28, 1959, p. H4. ^ Adams, Michael. "'Plan 9 From Outer Space': The Original Bad Movie We Love Turns 50." Movieline, September 8, 2009. Retrieved: November 4, 2013. ^ a b c "Goofs for 'Plan 9 from Outer Space' (1959)." IMDb. Retrieved: January 10, 2015. ^ "Plan 9 from Outer Space." BoxOffice Barometer, February 29, 1960, pp. 117, 130. ^ Jacobs, Chip. "The shocking musical truth of 1950's sci-fi." Archived February 26, 2012, at the Wayback Machine chipjacobs.com, October 25, 2011. ^ a b "Plan 9 from Outer Space Soundtrack (Retrosonic)." Digitalmeltown.com. Retrieved: January 10, 2015. ^ Mandell, Paul. "Forty Year Mystery Solved: The Music Behind 'Plan 9 From Outer Space'." Film Score Monthly, Volume 1, Issue 69, May 1996. ^ "Plan 9 from Outer Space (1956) – Cast and Crew." AllMovie. Retrieved: January 10, 2015. ^ a b "Alternate versions for 'Plan 9 from Outer Space' (1959)." IMDb. Retrieved: January 10, 2015. ^ Hartlaub, Peter. "What makes a bad movie? For starters, take a look at 'Plan 9 From Outer Space'." San Francisco Chronicle, March 10, 2006. Retrieved: January 10, 2015. ^ a b McMillan, Dennis. "Ed Wood Festival comes to the Castro." San Francisco Bay Times, March 16, 2006. Retrieved: January 10, 2015. ^ "'Plan 9 from Outer Space'." RiffTrax, 2007. Retrieved: January 10, 2015. ^ "'Plan 9 from Outer Space' VOD." RiffTrax, 2007. Retrieved: January 10, 2015. ^ "BD Horror NewsL Ha! Ed Wood's Disasterpiece 'Plan 9' Gets 3-D Treatment!." bloody-disgusting.com. Retrieved: January 10, 2015. ^ "Vampira: The Movie." Vampirathemovie.com, April 4, 2013. Retrieved: January 10, 2015. ^ Hulsey, Ken. "New Stills from Grave Robbers from Outer Space." robojapan, July 1, 2009. Retrieved: January 10, 2015. ^ "Plan 9's teaser trailer." Darkstone Entertainment, September 9, 2009. Retrieved: January 10, 2015. ^ "PLAN 9 – News." Darkstone Entertainment, December 23, 2014. Retrieved: January 10, 2015. ^ "Plan 9 from Outer Space Remake Landing in February". Dread Central. ^ Dave Barnett. "In defense of the so-called worst movie ever made: Plan 9 from Outer Space". The Independent. ^ "Plan 9 from Outer Space". Rotten Tomatoes. Fandango. Retrieved April 16, 2019. ^ "Bottom 100." IMDb. Retrieved: January 10, 2015. ^ Raymond, Eric S. "Plan 9: The Way the Future Was." The Art of UNIX Programming. Boston: Addison-Wesley, 2003. ISBN 0-13-142901-9. ^ "Plan 9 from Outer Space: The Musical." Queen's Theatre, Hornchurch, Spring 1996. Retrieved: January 10, 2015. ^ "'Plan LIVE from Outer Space!'." IMDb. Retrieved: January 10, 2015. ^ "Plan 9 from Outer Space for Comic Relief." Cottiers Theatre. Retrieved: June 13, 2015. ^ "Plan 9 from Outer Space at the Edinburgh Festival". Retrieved September 25, 2017. ^ "The Chinese Restaurant". Seinfeld Scripts. Retrieved September 25, 2017. ^ "Plan 9 From Outer Space: Thirty Years Later." Atomic Avenue Retrieved: January 10, 2015. ^ "'Plan 9 From Outer Space'." Amiga Reviews. Retrieved: January 10, 2015. ^ "RiffTrax Live: Plan 9 from Outer Space." SF Sketchfest, 2008. Retrieved: January 10, 2015. Craig, Rob. Ed Wood, Mad Genius: A Critical Study of the Films. Jefferson, North Carolina: McFarland & Company, 2009. ISBN 978-0-7864-5423-5. Grey, Rudolph. Nightmare of Ecstasy: The Life and Art of Edward D. Wood, Jr.. Portland, Oregon: Feral House, 1992. ISBN 978-0-922915-24-8. Peary, Danny. Cult Movies. New York: Delacorte Press, 1981. ISBN 0-440-01626-6. Schwartz, Carol. Videohound's Complete Guide to Cult Flicks and Trash Pics. Canton, Michigan: Visible Ink Press, 1995. ISBN 978-0-7876-0616-9. Sloan, Will. "Can Your Heart Stand the Shocking Facts About Kelton the Cop A/K/A Paul Marco?" Filmfax, April 2005, pp. 88–89. Thompson, Brett, director. The Haunted World of Edward D. Wood, Jr. (documentary film), 1996. Warren, Bill. Keep Watching the Skies: American Science Fiction Films of the Fifties, 21st Century Edition. Jefferson, North Carolina: McFarland & Company, 2009. ISBN 0-89950-032-3. Wikimedia Commons has media related to Plan 9 from Outer Space. This page was last edited on 16 April 2019, at 08:31 (UTC).